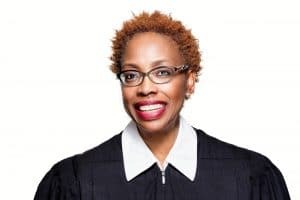 September 21, 2018 (Pierce County, WA)—Pierce County Superior Court Judge G. Helen Whitener has been elected co-chair of the Washington Supreme Court Minority and Justice Commission, taking up the position after longtime co-chair, Supreme Court Justice Charles Johnson, chose to step down. Justice Johnson served on the Commission beginning in 1993, shortly after it was formed, and he soon became co-chair along with late Supreme Court Justice Charles Z. Smith. Johnson said he chose to step away from his long-time role now for two reasons. First, when Justice Mary Yu joined the Commission and then became its co-chair in 2011, “I saw her leadership potential. I saw her expand the work and the impact of the Commission,” he said. “I couldn’t have been happier.” Second, he believed it important that a trial court judge be part of the Commission’s leadership to provide that voice and balance. “I couldn’t be more pleased that Judge Whitener is taking on this role,” Johnson said. The Minority and Justice Commission was established by the state Supreme Court in 1990 to examine whether racial and ethnic bias exists in the courts of Washington, to determine the forms it takes, and to take active and innovative steps to overcome and prevent bias. The Commission grew out of a task force established by state lawmakers in 1988. Some of its work includes annual symposiums that delve deeply into areas of the justice system impacted by racial and ethnic bias to examine causes and potential solutions; hosting Youth and Justice forums for high school students across Washington to introduce them to the justice system; grant projects such as a recent examination of Legal Financial Obligations (LFOs – court fines and fees) and how they impact people of low-income and people of color, and much more. Judge Whitener was appointed to the Pierce County Superior Court in 2015 by Governor Jay Inslee. Prior to her appointment and subsequent election to the superior court, Judge Whitener served as a judge on the Washington State Board of Industrial Insurance Appeals, and as a pro-tem judge in Pierce County District Court as well as the Tacoma Municipal Court. She had previously worked as a prosecutor and a defense attorney. Justice Yu said Whitener had an impact on the work of the Commission even before stepping into the co-chair role.